The Ice Cream Truck is the kind of movie title that promises one of two things: an astute, campy black comedy or a waste of my time. Perhaps it’s her pedigree (granddaughter of Elmore Leonard), but writer/director Megan Freels Johnston’s film falls, frustratingly, somewhere in the middle. First things first. It may be a bit of a disservice to advertise Freels Johnston as the granddaughter of a celebrated crime author because who can live up to that? Just because you share DNA with someone, it doesn’t mean that you also share talents. From feature length films to television shows based on his short stories, Leonard’s witty and complex tales have been in our collective consciousness for decades. Out of Sight is a delicious, compulsively watchable film and if you never watched Justified, then what have you been watching on tv? Get Shorty, Jackie Brown, 3:10 to Yuma, Be Cool…I could keep going. So, when someone is touted as sharing this level of writing talent, I think it’s more than fair to be disappointed when they don’t quite measure up. Ok, ok, let’s be fair and take her grandfather out of the equation (even though I never knew he was there until I was told). The Ice Cream Truck wants so desperately to be a quirky, black comedy about the trappings and compromises of suburban living, but because it only coyly teases with horror and never fully commits, it just ends up feeling like a beautiful, confused mess of female emotions, regrets and observations. And this all just makes the viewer feel as conflicted as Mary does about her feelings towards her young, hot neighbor. Mary (a superb Deanna Russo) has arrived a week ahead of her family to their new suburban abode. While her husband and two children make their way to her, she has a week alone in a home with no furniture and she hopes to utilize this time to get some writing done. When her nosy neighbor assumes that Mary writes for a blog, Mary is immediately offended and I guess I should be, too. Silly women staying at home with their children and idly filling their “spare” time with writing: the nerve. Facing a bout of writer’s block, Mary casually reconnects with her youthful self while also unknowingly becoming the target of various creepy men. The mover who delivers her furniture, the food delivery guy, the titular ice cream man and the aforementioned hot, young neighbor. Of course, Mary doesn’t identify Max (John Redlinger) as dangerous because he’s handsome, reminds her of how she felt when she was his age and he supplies her with pot. It cannot go unsaid that believing Max has just graduated high school is as believable as Luke Perry playing a high school student in Beverly Hills 90210 was back in the 90’s. Emil Johnsen is the ice cream man in question and his eerie commitment to retro realness, from his uniform to his excellently maintained truck, is the creepiest thing about him. Well, it’s also highly suspicious that his ice cream truck prowls the neighborhood at all hours of the day, but this neighborhood is so dang quirky that no one questions that. 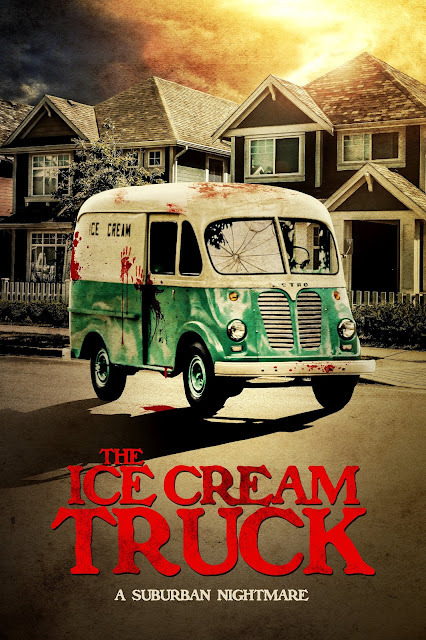 Overall, the storyline of this ice cream man feels tacked on after the fact and that’s too bad because there is a wicked cool POV kill shot and Johnsen is wonderful in the part. The Ice Cream Truck is a gorgeous, technicolor nightmare with a keen grasp of, specifically, the evil and silent warfare that exists among mothers and the internal conflict we all face when realizing we’re no longer the young kids in the neighborhood. The pacing is slow and languid in a way that feels just as wonderful and excruciating as a hot, summer day and all of the performances are solid. With a WTF ending (not the good kind) and an overall feeling of a wackadoo ice cream man being needlessly tacked onto an otherwise smart takedown of suburbia, The Ice Cream Truck is as unfulfilling as a low carb, no fat, sugar free scoop of Rocky Road. But what do I know? I’m just a suburban mom who writes for a blog.